OLDRIGHTIE: The Establishment Fire Blanket. Smothers Any Possible Flare Up! John Ward aka The Slog makes for a far more incisive and stylish resume of how it all works today. Works as in for those jerking our chains, that is. 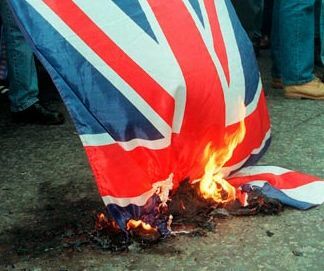 The LIBOR scandal was a sudden and unexpected flare up quickly suffocated by the emergency use of the "fire blanket". The main elements of this ultra thick fire suppressant is, naturally the BBC. The initial take was "get Barclays". Firstly a whopping great donation to preserving the Mandarins' bonuses, in the form of fines levied by The FSA, then see the blame squarely placed on the bank's executives. Behind closed doors immunities and pay offs were agreed, providing any fall out that might affect the real ruling classes, ensconced in Whitehall, would be smothered. The initial shock that the ultra incompetent excrement that is spewed from our Governing classes might be identified at source, via The FSA, was a momentary panic. Overnight Diamond was schooled as to how the consequences of pursuing the real nasty culprits in Government, together with their shady accomplices known fondly (sic) as Sir Humphreys, was not a good idea. He and his pals were probably shown videos of Italian bankers dangling from under London's many bridge ramparts. Possibly, to the likes of the greedy and avaricious, financial ruin was also on the table. Quiet references to the power and might of the Secret Services' freedom to murder without fear of retribution was also offered as an alternative to backing off. Additionally the backing off option will also have come with a big bundle of tax payer dosh. So a no brainer really. When this cretinous member of the bankster hierarchy was trotted out before the equally obnoxious politicians, every single one of them in the room were fully briefed as to their fire fighting role. Take a corner of the blanket each and smother any trace of the burning stench rising from this sudden flare up. A flame of deceit, collusion and sheer evil nastiness. So, this very morning, The BBC, as in Newsnight last evening, "cocked a deaf 'un"! Newsnight regaled us with the underlying and unsaid passion to reduce the elderly population by whatever means. Give their homes to the feckless, increase their tax via devaluation and inflation and fundamentally ban anybody, not rich or destitute, from existing after 70 years of age. As for the rest of the BBC the big issue is the destruction of our armed forces. A nice knock the Government subject which they know full well resonates with The Public. That this is all part of the run down of our national defense in order to accelerate the EU Defence Force take over, is naturally hidden. Ironic how the attacks against the "Right" use the very sacred cows of that persuasion to gain attention, whilst the underlying agenda is so avidly of the left. It really is all very obvious if we care to look at what and how things are manipulated. It is subtle at times, glaringly blatant at others. It is also very powerful and very, very unpleasant. The most unpleasant of those who collude in this despicable behaviour are those who should know better, aren't they, Mr Boy? Marcus Agius is on the BBC board ( £48K for 20 days work) and has an "impressive and very successful track record in managing large institutions". Mr Agius will see out his term with the BBC before stepping down in November. All very polite. How nice to know we're paying for this bankster through our tv tax. Fined £3oom for corrupt practices but it's still ok for him to advise the BBC. It's a club with expensive membership fees but once you're in, boy does it pay well. This libor rate fiddling is a huge story, something that effects us all as you say the fire team has been at work franticly behind the scenes dowsing the flames. Even the american press is strangely silent on it all I just don,t know what is going to make the system blow I thought that this would do it but it looks like I am wrong. Jacobite, I too hoped this would be burnt fingers time. It's very scary, their grip on power and our very lives. I was looking online at Daily Mail this morning and saw this photo of the great and the good who lord over the rest of us. Notice not one black face if a company put a photo like that out thats the first thing the 'jobsworths' would be saying. I now notice the item is gone did the penny drop. The darker skinned despots tend to stay in their own lands funded by those you see in the picture, Anon. Good news for you ole chap. On The Fourth, i had planned a spectacular demonstration, however the fireworks display was unknowingly cancelled, due to a drought that we have been having. So, i had seen some few that decided to shoot some fireworks near the planed event--in a parking lot. After it was all done, i yelled: God save the Queen! Damn this Free Mason-Deist-French Catholic Conspiracy Republic! May God save the Queen!